Most Turnkey Engines built by Pat Downs are based on the Builder's Choice Engine Kits, and then slight changes are made based on each customer's specific needs. All parts are brand new, and every engine is blue-printed, carefully assembled and dyno-tested by our in-house engine builder, Pat Downs. We design and build engines for many different applications; street, strip and off-road. ONE ENGINE IS NOT THE ANSWER FOR EVERY PURPOSE! 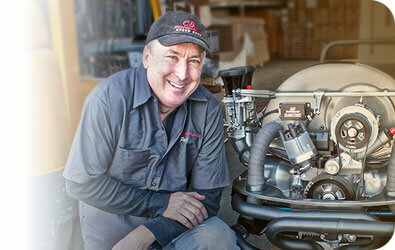 Let CB Performance build your dream machine, and get the job done right the first time. Below are a few popular displacement sizes for Turnkey VW Engines built by Pat Downs of CB Performance. Generally, the assembly fee for a long block (with all parts purchased by customer) is around $800 (2276cc and larger is $1000). Complete Turnkey Assembly, with Dyno Tuning starts at around $1400 (in addition to the cost of the parts). Features such as Crank Trigger, Gen4 EFI, Black Box or Custom Powder Coating are all available for an additional cost. Shipping and Handling are an additional cost. 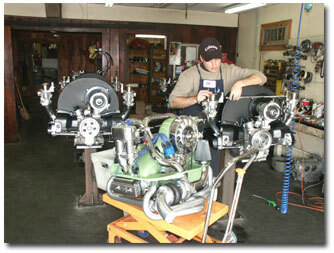 Turnkey Engines can also be picked up in-person for no additional charge. If you have any questions about Turnkey Engines that are not already covered here, please e-mail pat@cbperformance.com with your inquiry. Please allow up to a week for a response.